It’s no secret that I have a passion for productivity, and with that a constant quest for software that allows me to be focused and organised. Before moving to the Mac, I used to love a couple of Windows based programs, “Keep It Real” and “MLO”, the first was a system I designed back in 2005, which is still in use with the company I was working for, the latter is a great tool. The problem is, while I use Windows on my VM, it’s not always running, so I wanted an OS X interface. 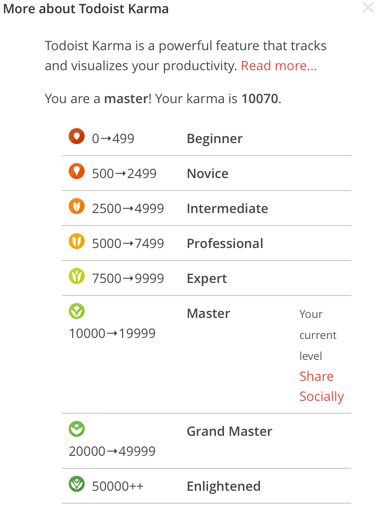 I’ve looked at online system, some good, some not so, and I’ve tried some ‘hybrid’ applications too, the latest was Todoist, which had a great way of helping you keep focused by using ‘Karma’ points, the more you used the system, the more points you got, attainable levels keep you aiming at becoming ‘Enlightened’. I recently reached ‘Master’ which was an ego trip, but I still felt there was something lacking from the UI on the Mac app. Smartsheet, Wrike & TeamworkPM are all worth a mention, but their primary interfaces are web based, and I’m sorry, (well not sorry), I am yet to find a web ui that is as rich and smooth as desktop, also some of these are designed for collaboration not so much an individual user. I’ve had varying success with some web interfaces, sometimes dragging or moving tasks around cause problems including data loss or things ending up in the wrong place. My journey begins again, looking for the best tool. I’m starting out by reviewing ‘Things’ and ‘OmniFocus’, both of which I have licences for. Having just finished reading some reviews and I’m still torn which I should start with. Things certainly has a nice clean interface, but OmniFocus seems to have some extra features. One boasts better sync than the other, oh man. Of course it is all daunting when starting from scratch, but then there is something refreshing about a clean page, things that have been hanging around and you really don’t think you will get to are able to be dropped, it’s like a spring clean for your mind and todo list. … decision made … I will run OmniFocus for a minimum one month, along with the companion apps for iPhone and iPad. After that I’ll write a mini review (so there will be no bias towards Things.) After the month if there are any areas that I believe are weak, then a switch to Things for the same period will be made. Who knows, maybe in that time Todoist will bring out a new slicker interface? or maybe MLO will announce a Mac version!